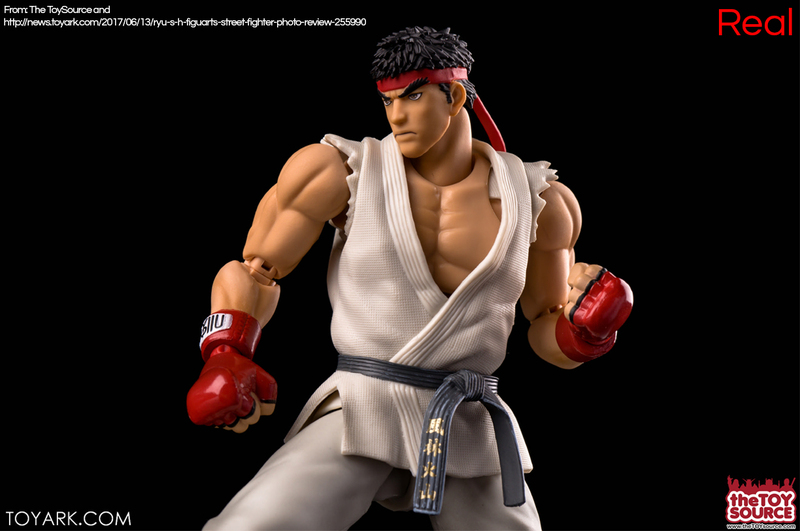 Ever since 1992’s Street Fighter II catapulted the fighting genre into the gaming stratosphere, its main protagonist, Ryu, has been one of video games’ most recognizable icons. 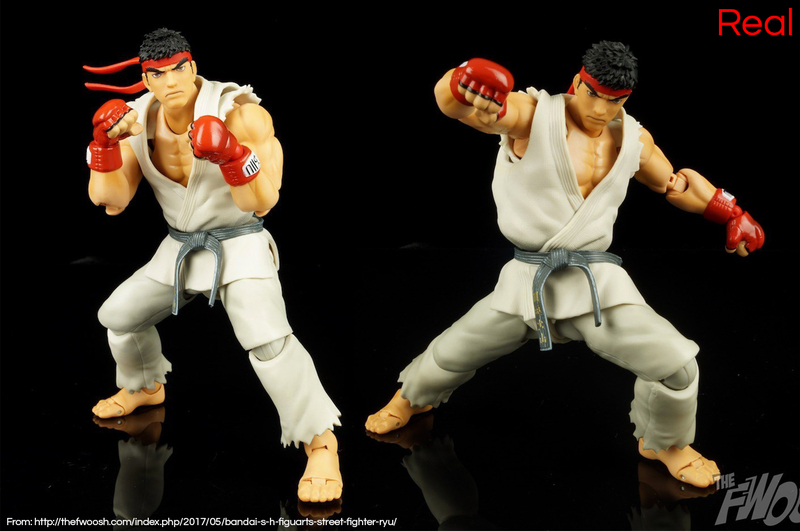 Revered Japanese toymaker Bandai is well aware of Ryu’s popularity, because soon after the release of Street Fighter V, it acquired the rights to produce figures based on the Eternal Warrior under the Tamashii Nations S.H. Figuarts brand. Regrettably, Bandai has been the target of unscrupulous parties for years. Numerous illegal reproductions of S.H. Figuarts toys have already been discovered. And, as is evidenced by this counterfeit S.H. 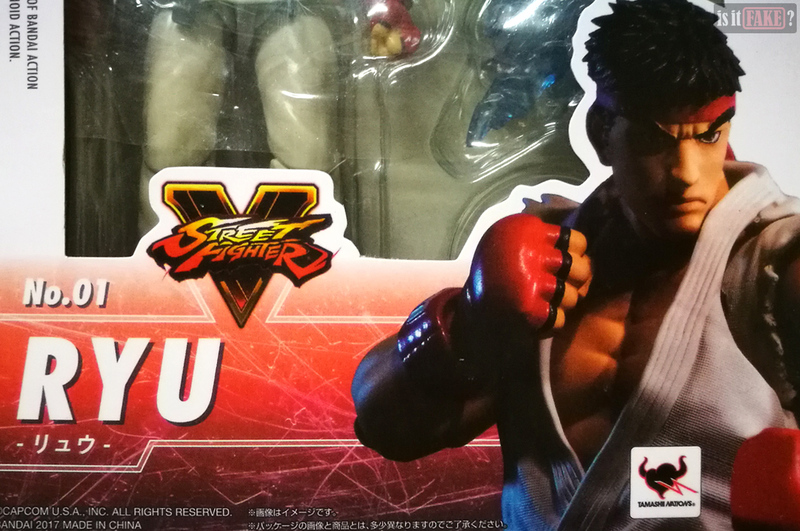 Figuarts Street Fighter V Ryu we just got, these pirates have no plans of stopping anytime soon. Most serious toy collectors detest fakes. For this reason, the bigger, more well-known speciality toy stores make it a point to sell only legit, licensed products. They do, after all, have a customer base to satisfy and a reputation to protect. But there are smaller shops with less recognizable names, and from such places you’ll sometimes find a number of oddities. Figures of questionable quality sold ridiculously cheap. Figures sold without boxes. Boxes without seals, official manufacturer/distributor logos, or emblazoned with Chinese characters. It’s highly possible some of these sellers don’t even know they’re peddling fakes. Oftentimes, you’ll find counterfeits sold alongside authorized toys, which was the case with the store where we purchased this fake S.H. 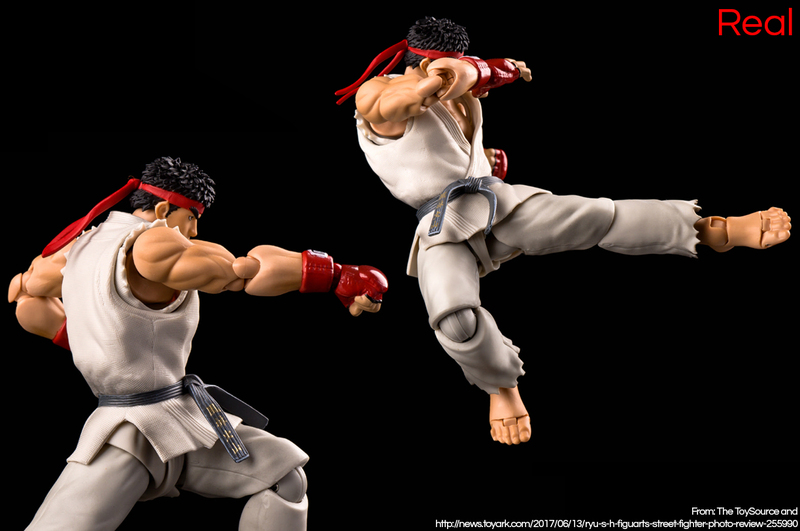 Figuarts Street Fighter V Ryu. It’s difficult to ascertain where precisely this figure was manufactured. Given the great number of fake S.H. Figuarts from China, however, it’s possible this specific bootleg was also produced in China. Admittedly, this is an extremely clever fake. 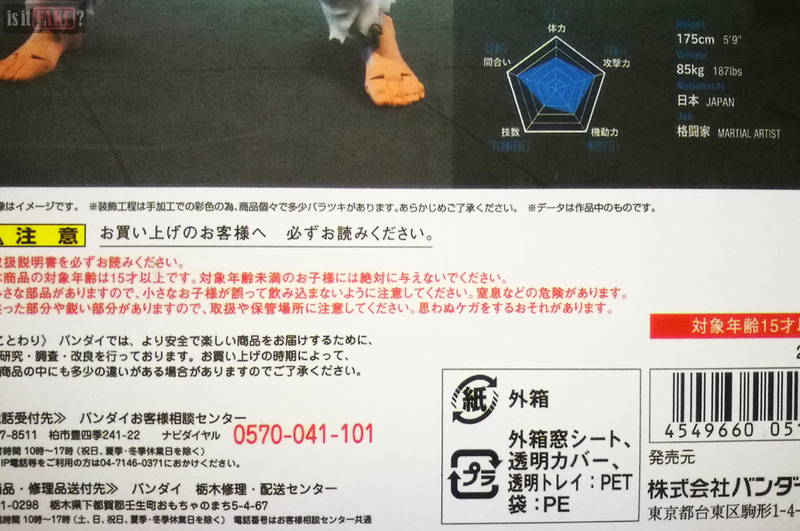 The toy comes in a sturdy box featuring official-looking art, a bunch of information in Japanese, and the expected manufacturer and toy line logos. It even has a barcode. Viewed at a glance, you’ll never know you’re looking at a counterfeit product. So what tipped us off about this being a fake S.H. Figuarts? One major detail: the price. Because most figures from Japan boast incredible quality, these products seldom come cheap. S.H. Figuarts are usually priced USD $22 and up. The real S.H. 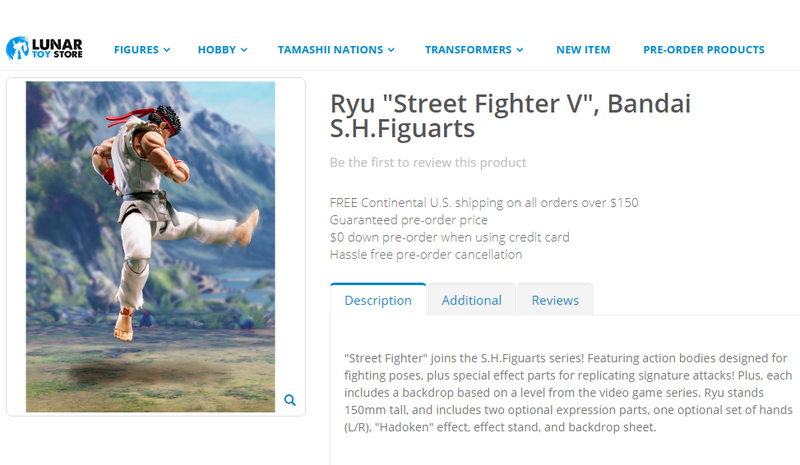 Figuarts Ryu, specifically, costs USD $50 and up. 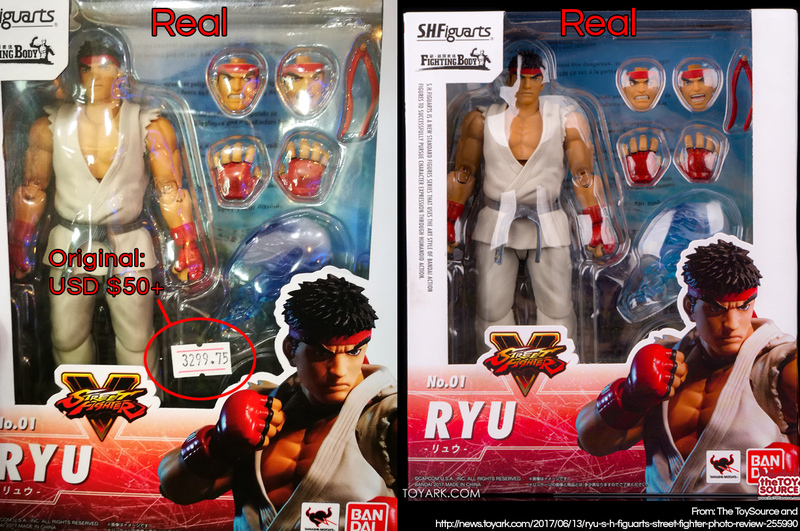 Fake Ryu cost us only USD $17. And in the case of Japanese toys, cheaper rarely means better. After we established this item was priced suspiciously cheap, we decided to compare it with official S.H. Figuarts Ryu figures. It was only then that we discovered a surplus of other problems. 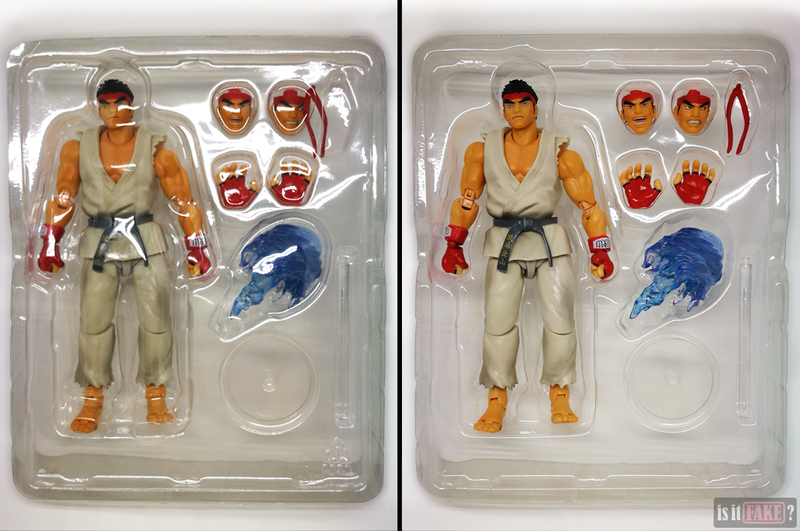 The front of fake Ryu’s packaging lacks the Bandai logo in the lower right corner. By looking through the plastic window, it’s also obvious the blue background with text is missing. 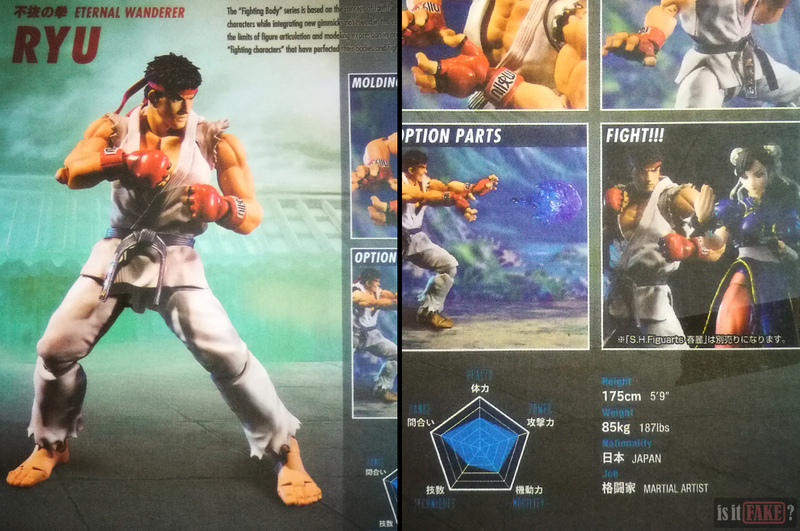 You’ll notice the arrangement of fake Ryu’s accessories differs from the original’s. The heads have switched places, and the hands are turned around, so the palms face outwards instead of inwards. 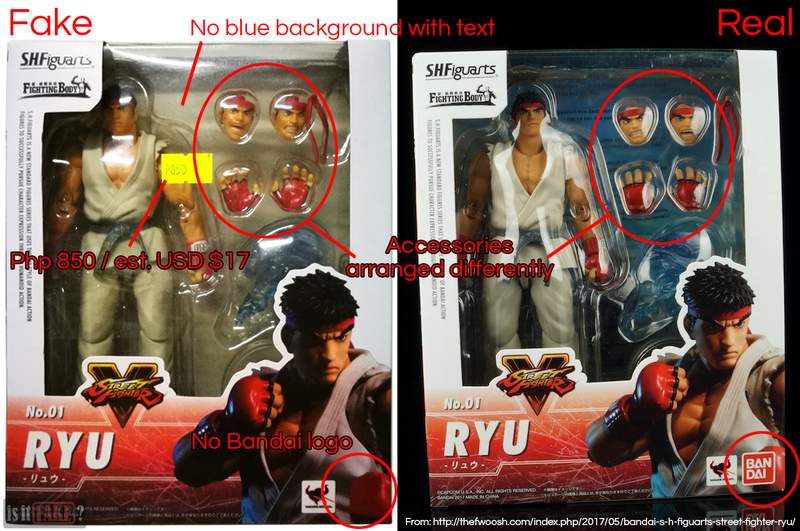 Licensed Ryu figures all feature a consistent arrangement of the accessories – an arrangement that isn’t reflected in the way fake Ryu is packaged. At the back of the box of licensed S.H. Figuarts Ryu toys, you’ll find one or a combination of any of three stickers: a shiny Capcom seal, a shiny Bandai seal, and a Bandai product code. Fake Ryu has none of these stickers. The absence of official manufacturer/distributor seal stickers is often a telling clue that the product is a bootleg. While it’s true not all real S.H. Figuarts items bear these seals, the real S.H. 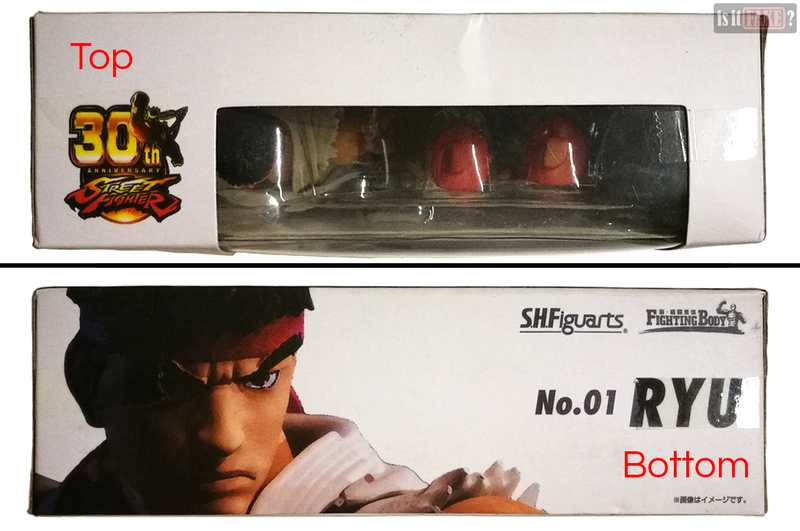 Figuarts Street Fighter V Ryu is one of those specific Bandai toys that always comes with at least one seal, so the absence of such should be a dead giveaway that something’s off. 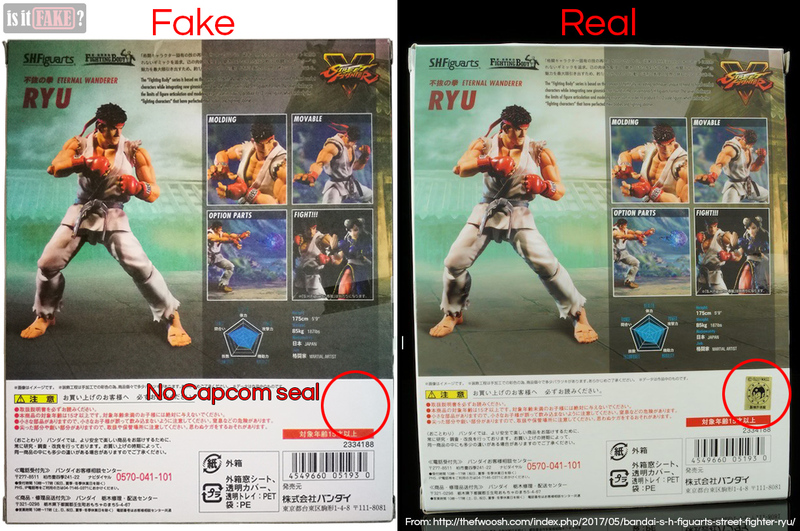 Lastly, the art adorning fake Ryu’s packaging uses lower quality ink. The difference is minor, so it’ll be tough to tell from the pictures. But seen by the naked eye, you’ll observe minor blurring and flatter colors. 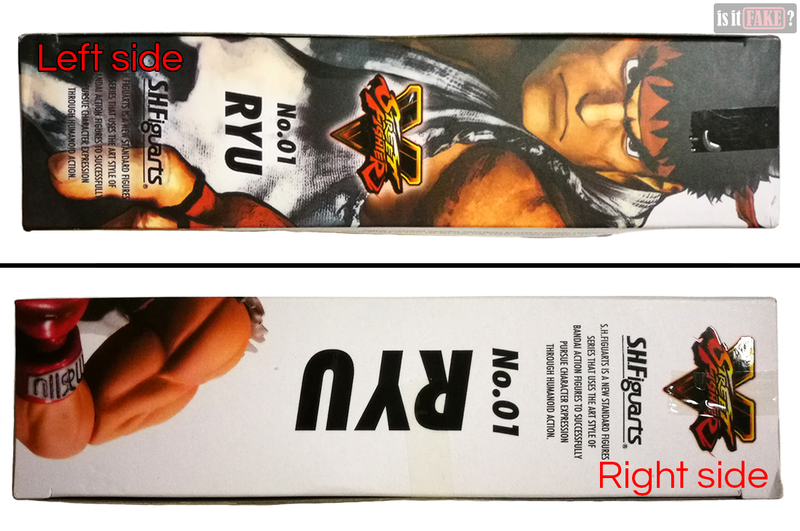 Any doubts about the counterfeit nature of this Ryu figure vanished not long after we removed it from the box. The moment we lifted Ryu from his plastic shell, his left leg fell off. This is no exaggeration; the leg simply fell off. Frustrated but not entirely shocked, we tested the other leg to see if it would come off just as easily. It did. It doesn’t take much effort to pop off other body parts. 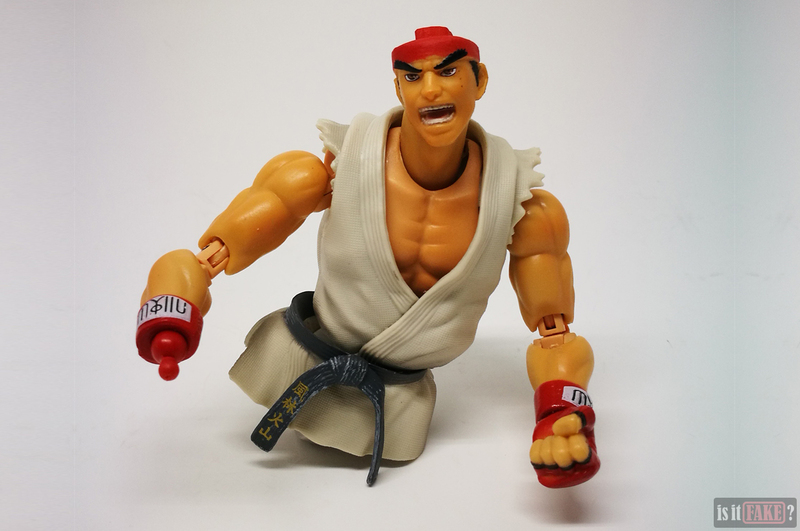 In fact, we found it much more challenging to pose fake Ryu, because every time we played around with him, he would crumble to pieces. Fake Ryu is so fragile he requires the handling of extremely delicate hands. 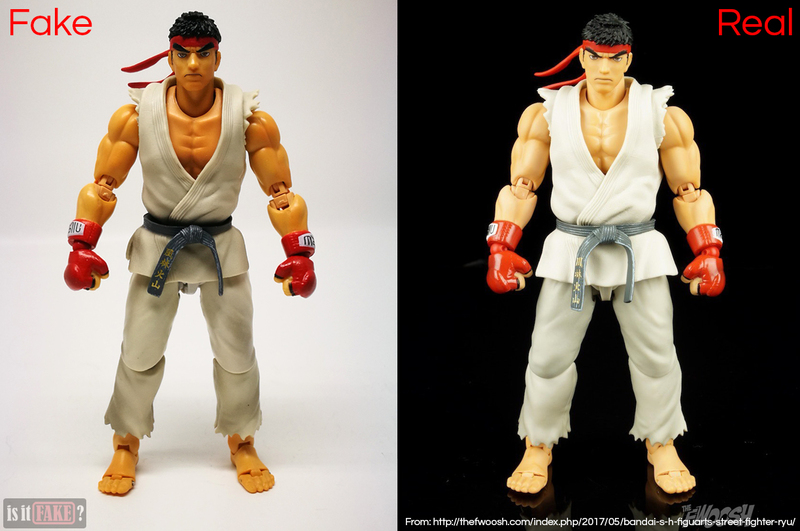 We noticed the paint applied to fake Ryu’s eyes is a little unclean, and possesses a flatness that makes said eyes look dead. There’s also some paint slop on his hands and faces. Japanese toy lines such as Bandai’s S.H. Figuarts are well-known for their excellent paint quality. While you would expect some minor imperfections even from an official product, none of them would have such noticeable blemishes as those found on the fake. 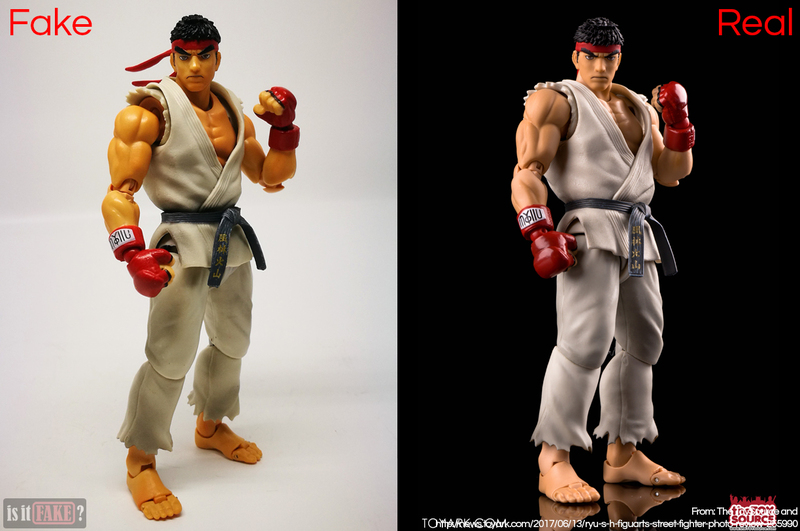 Overall, fake Ryu’s paintjob is also a tad darker. 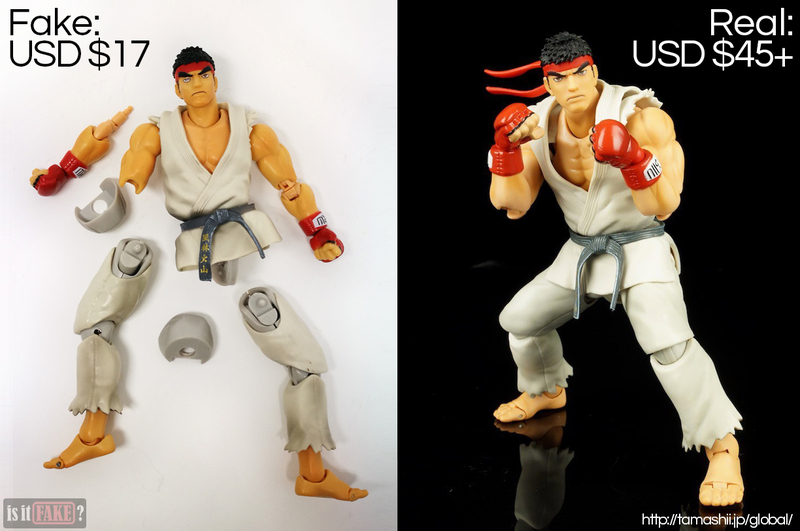 We also discovered an enormous problem with fake Ryu’s interchangeable parts. Basically, the holes of the extra hands and heads are too small, so it’s impossible to fit the ball joints into them. This means you’ll never be able to attach those extra hands to fake Ryu’s wrists. You can find a way to balance an extra head on top of the neck’s ball joint, provided you don’t move the figure around too much. 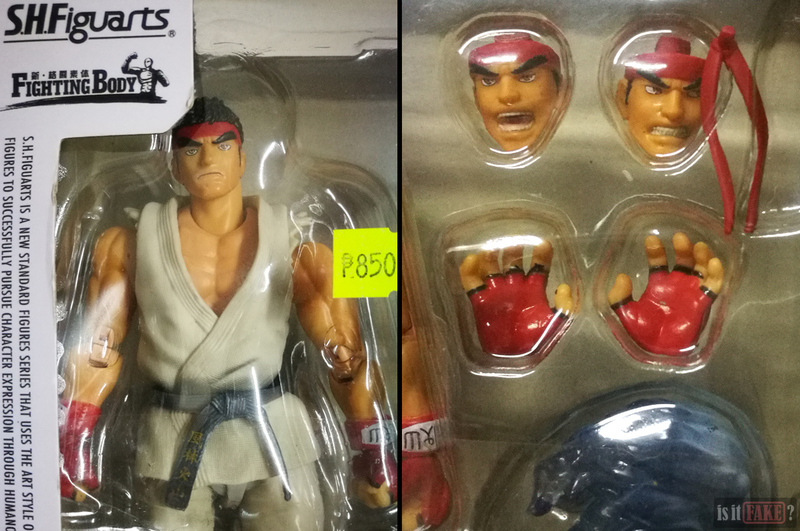 There’s an additional huge issue with fake Ryu’s interchangeable heads. 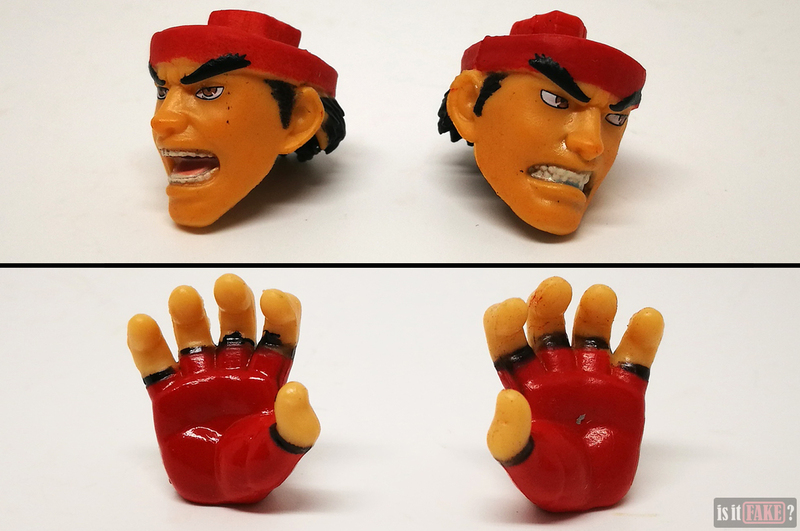 Official Ryu’s head-related accessories actually have two components: three different partial heads, and one removable hair piece. While the single hair piece is meant to be shared among all three partial heads, it comes attached to the default partial head. 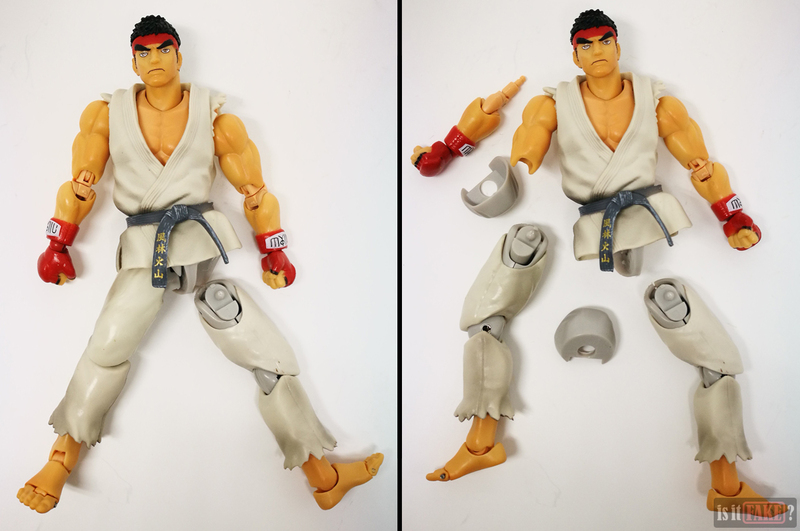 To change Ryu’s expressions, you therefore have to pop off the hair, then attach it to a different partial head. 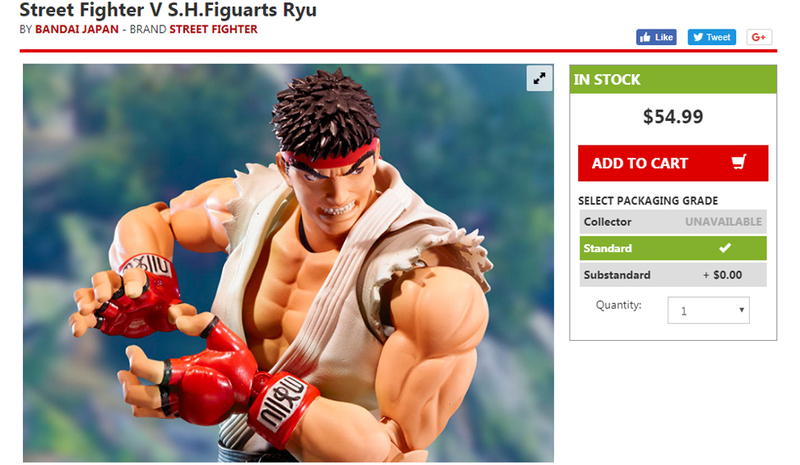 Sadly, Fake Ryu’s hair is permanently attached to his default partial head. This means the additional partial heads can never have hair, and thus can never be complete heads. 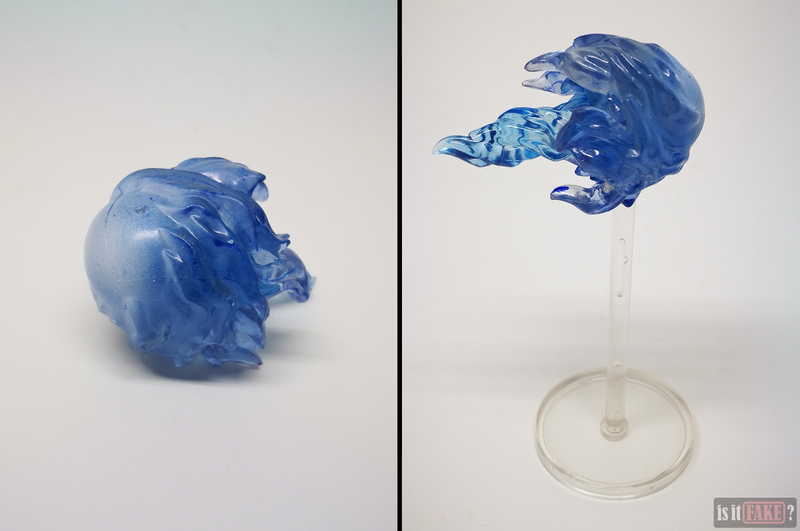 Fake Ryu’s fireball accessory lacks the luster of real Ryu’s. In fact, it appears quite dull, and even has some paint chip. 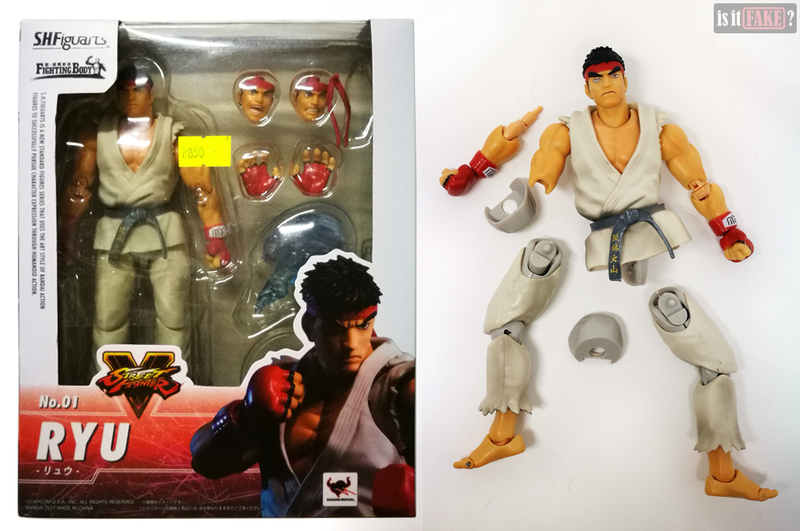 Lastly, fake Ryu doesn’t come with cardboard pieces adorned with stage art taken straight from the Street Fighter V game. 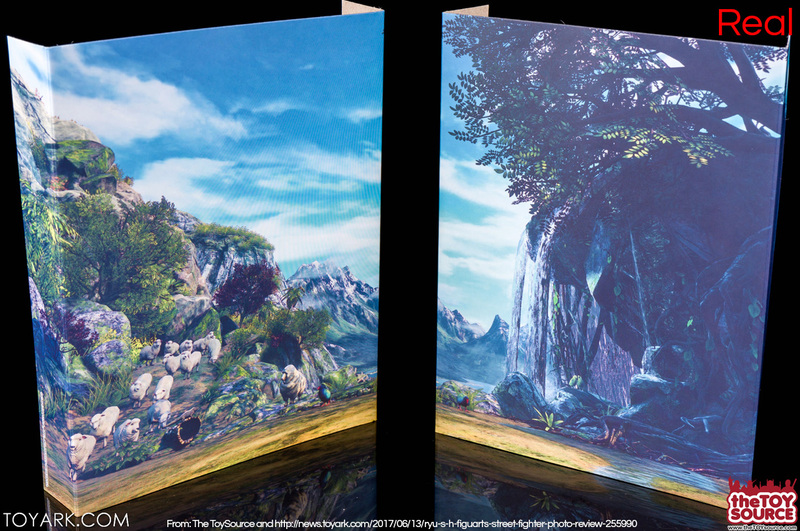 In the official product, these pieces can serve as a backdrop to the figure, allowing you to recreate a scene from the game. It’s true that bootlegs come at a fraction of the price of official Japanese toys. You have to remember, however, what you’re getting for that lower price. Fake S.H. 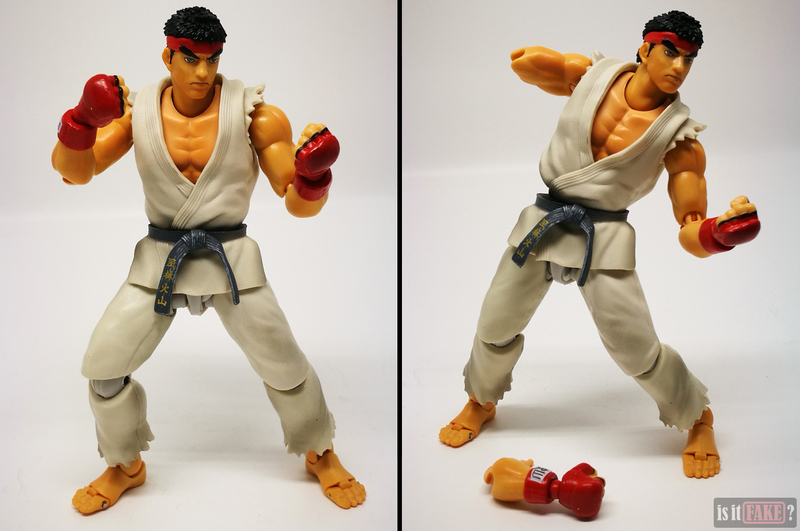 Figuarts Street Fighter V Ryu is totally unposeable. He can’t be played with. His accessories are absolutely useless, while the cardboard backdrops are nowhere to be found. All that, and his paint job is inferior, to boot. 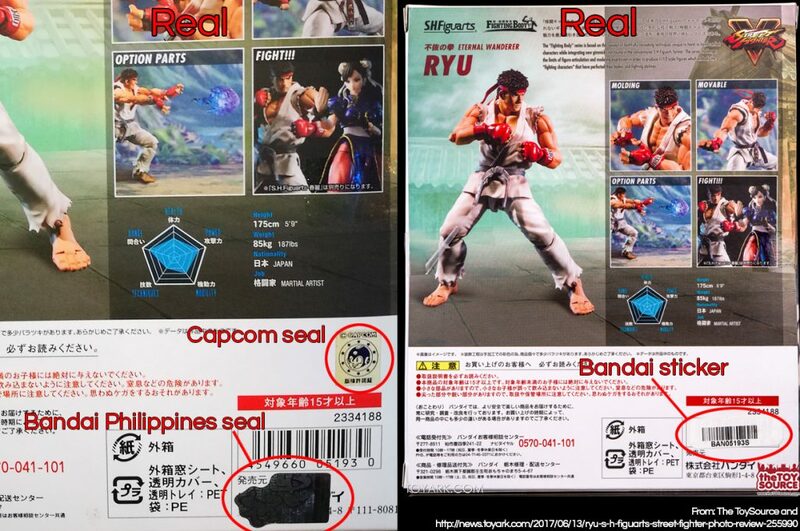 Fake Ryu is most likely a factory reject. 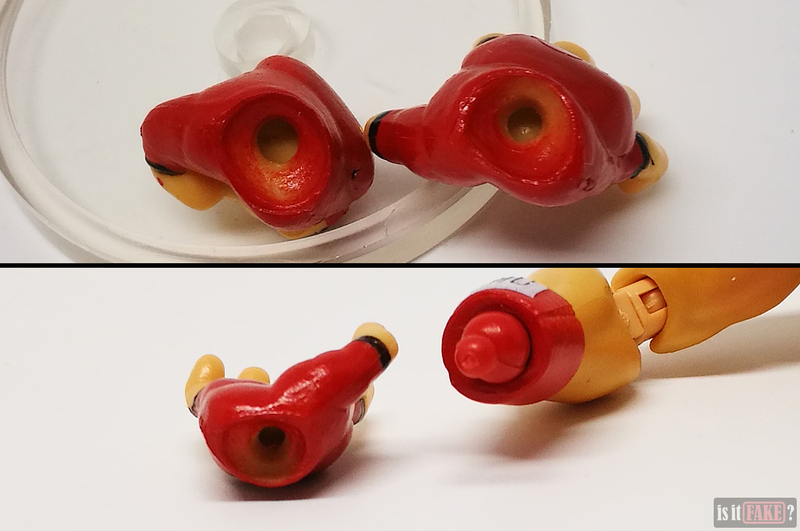 Sometimes, mistakes happen during the manufacturing process, which leads to defects in the toy. Toys with defects fail quality checks and are then thrown in the trash. Some people, however, take these discarded toys and resell them without the consent of the official manufacturer. So what you are paying for is literally garbage. Depending on the store, the official S.H. 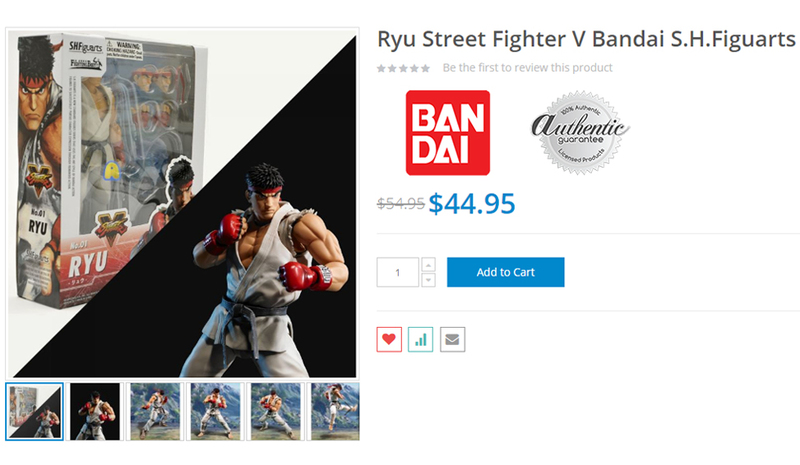 Figuarts Street Fighter V Ryu can cost anywhere from USD $45 to $70+. But he’s got tight joints, a full set of accessories, and he doesn’t crumble into a pile of loose plastic parts, allowing for a variety of exciting poses. His paint job is spectacular and devoid of ugly blemishes. Simply put, he’s an amazing figure, and would make a great addition on your desk or in your display case. The best thing to do when searching for official S.H. Figuarts figures is to visit the official Tamashii Nations website. From here, you can visit other Bandai-related sites all over the world, some of which have online stores selling S.H. Figuarts. Here’s the official Japanese site for the S.H. Figuarts Street Fighter V series. You can also visit BigBadToyStore, Lunar Toy Store, or AnimeBLVD; these are online shops where you can find Bandai’s S.H. 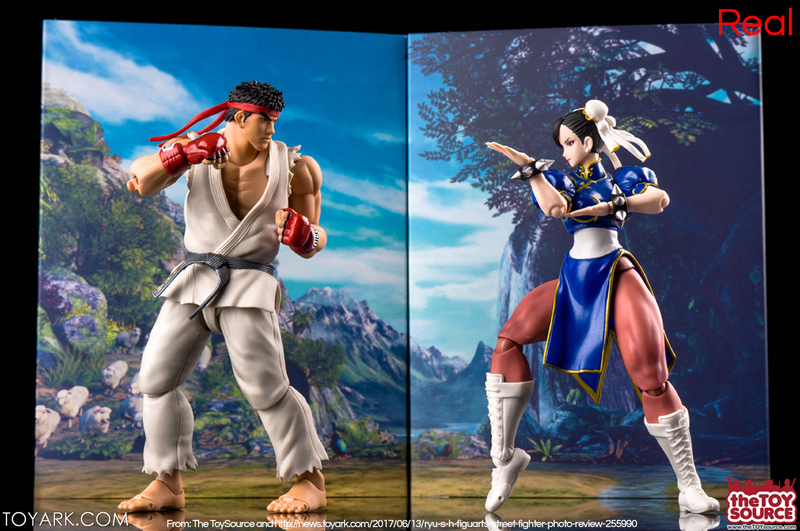 Figuarts products, including Street Fighter V Ryu. There are a number of other popular, well-respected specialty online and/or physical toy stores where you can buy S.H. Figuarts toys. 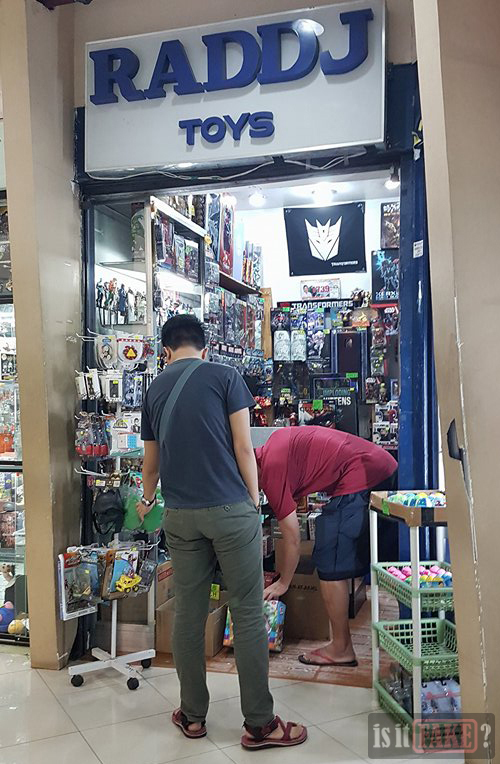 In the Philippines, two great shops are Hubbyte Toy Store and Great Toys Online. The former is an online store, while the second has both an online store and a number of physical stores across Manila. As mentioned earlier, a majority of serious toy collectors are sticklers for authenticity, and will turn their noses up at fakes. One bootleg is enough to ruin a store’s reputation. These big toy stores therefore exert extra effort to ensure all their products are legit. At any rate, do your research about a store before buying figures from them. Pay attention to customer reviews. If possible, join toy communities and online forums, where you’ll find plenty of discussions about which stores are 100% legit, and which aren’t. And if the figure you want isn’t currently available, don’t hesitate to inquire about it. Many of the best shops are in direct communication with official toy distributors, and will gladly allow you to place a special order for the desired toy. Not even the combined strength of Ryu and Bandai were able to prevent this bootleg from happening. But you, as the buyer, have the power to put an end to it. With his ability to fall apart with alarming regularity, incomplete accessories, and sloppy paint, fake S.H. Figuarts Street Fighter V Ryu is absolutely not worth the purchase. For these reasons, he earns a 95% terrible rating.